The DC Illini club hopes to inspire other U of I clubs and groups to raise money too. 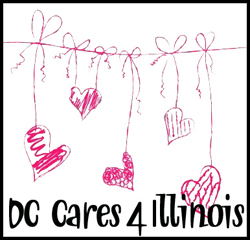 The Illinois Alumni Club of Greater Washington DC is working with the Bradley University Washington DC Alumni Chapter and four other alumni clubs, to host DC Cares 4 Illinois, a fundraiser benefitting the victims of the recent severe weather in central Illinois. Suggested donation: $20 at the door. All money raised will go to the Central Illinois Red Cross, which will disperse money raised among the impacted communities.